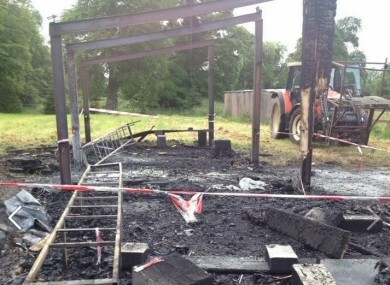 Loughglynn FC in Roscommon had their entire world burnt down at the end of June. A LOCAL FOOTBALL club in Roscommon has seen its world burnt to the ground, and all they have left to work with are two footballs. The fire occurred on 26 June and burnt the team’s clubhouse, including three dressing rooms and the equipment lock-up, beyond recognition. “We’ve been told it will cost between €20,000 and €30,000 to build it up again. We’re even worried about the cost of the fire brigade,” chairman Pat McDonnell told the Roscommon Herald. The club has been around since 1976, and built the ruined clubhouse with their own hands in 1997. Speaking to RTE’s Tubridy on 2fm Pat’s son Seán, the club secretary, said that Loughglynn are now down to “two footballs and a set of jerseys”. The club now has until next month to get their facilities back up and running before the start of the new season. “We’re just a tiny little club in a tiny little village in the north-west of Roscommon. We keep ourselves to ourselves. But for us the clubhouse is the hub of the community. Everything is gone, I think we’re down to a set of jerseys and two footballs. Everyone is just gutted and gobsmacked, and can’t understand how something like this could have happened. Gardaí are treating the circumstances surrounding the fire as suspicious and are appealing to the public to come forward if they have any information. As for Loughglynn, the challenge for them now is to get back up and running, and they’re going the crowdfunding route. “We want to come back bigger and better, and for that we’re estimating we’ll need €30,000″ said Seán. We have until August, but since we launched the appeal people have been absolutely fantastic, like Eire Óg the local GAA club have offered us the takings of their week’s Lotto, we’ve had clubs from as far away as Achill Island offering to help. Thanks to @EireOgRos for generously donating this weeks lotto monies to our rebuilding fund, very much appreciated, thank you. So far the club has raised more than €2,000 in a little over a week and a half. We’re so grateful to the community at large – people have been absolutely brilliant. If you’d like to contribute to Loughglynn’s funding appeal you can do so at gofundme.com/loughglynnutd. Email “Club ruined by fire are down to their last two footballs...”. Feedback on “Club ruined by fire are down to their last two footballs...”.